Starbucks wants its stores to put a lid on the latest controversy brewing over their cups. The coffee giant on Friday reminded outlets that they don't have to write or call out names when a customer orders a cup of joe. The advisory comes after supporters of Donald Trump said employees at a Miami Starbucks refused to write "Trump" on a man's coffee cup after telling them that was his name. "Over the years, writing customer names on cups and calling out their names has been a fun ritual in our stores. Rarely has it been abused or taken advantage of," Starbucks said in a statement. "We hope and trust that our customers will continue to honor that tradition. We don't require our partners to write or call out names." A customer later identified as David Sanguesa said he had an argument Thursday with a barista who wouldn't write "Trump" on his cup, and resorted calling the action anti-white "discrimination." The incident was shared on social media, and picked up by Twitter user Baked Alaska, who encouraged the hashtag #TrumpCup. "All these businesses are discriminating against Trump supporters when we won the election. ... We're not some minority here," Baked Alaska said on Periscope. Hundreds of Trump supporters have since posted photos of themselves on Twitter with "Trump" cups in a show of solidarity. This isn't the first Starbucks controversy with Trump supporters. In November, some of them admonished the company for their new green cups meant to promote unity, saying it was a "liberal bias" and "political brainwashing." 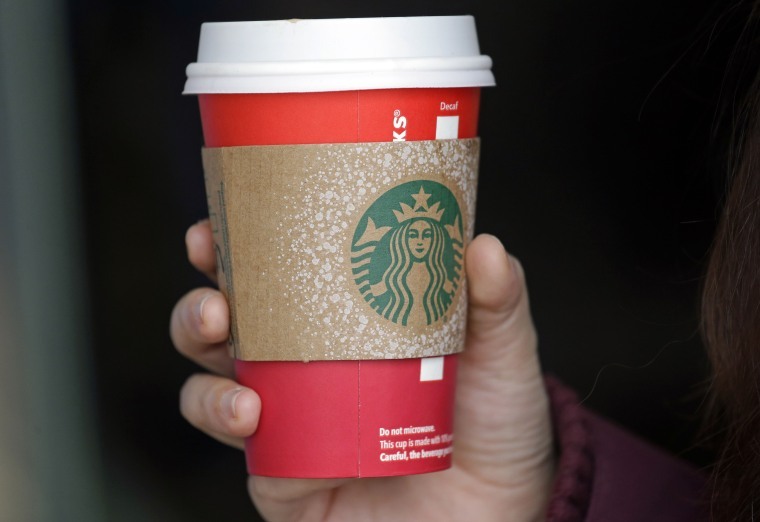 The coffee chain also received backlash last December after releasing red cups devoid of Christmas imagery.